ALS Research Forum | Drug Discovery ReFRAMEd and Reimagined? Drug Discovery ReFRAMEd and Reimagined? A new tool may help researchers identify new treatment strategies for ALS. 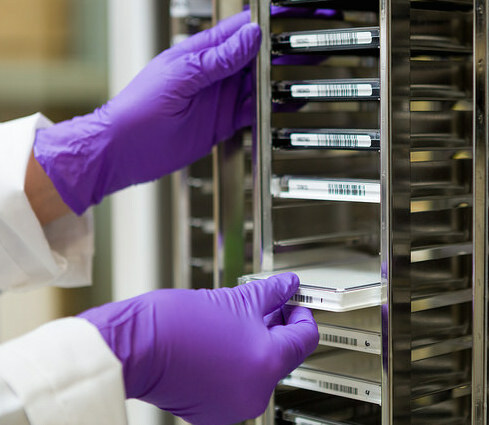 The high-throughput screening library, known as Repurposing, Focused Rescue, and Accelerated Medchem (ReFRAME), includes nearly all small molecules that have been previously tested in the clinic. The results of human safety studies and PK/PD analysis for each compound are also available. ReFRAME is the largest and most comprehensive collection of investigational and FDA-approved drugs developed for drug repurposing to date. The open-access resource is designed to speed up the development of treatments for rare and neglected diseases to meet urgent unmet medical needs. ReFRAME is being developed by a research team led by Pete Shultz and Arnab Chatterjee at Calibr, the drug discovery division of the Scripps Research Institute in La Jolla, California. Interested in accessing ReFRAME and/or collaborate with the Calibr team? Contact Kelli Kuhen, Director of Global Health Programs at Calibr. Janes J, Young ME, Chen E, Rogers NH, Burgstaller-Muehlbacher S, Hughes LD, Love MS, Hull MV, Kuhen KL, Woods AK, Joseph SB, Petrassi HM, McNamara CW, Tremblay MS, Su AI, Schultz PG, Chatterjee AK. The ReFRAME library as a comprehensive drug repurposing library and its application to the treatment of cryptosporidiosis. Proc Natl Acad Sci U S A. 2018 Oct 16;115(42):10750-10755. [PubMed].